Nobody went outside. The outside world did not exist. There was no internet or television. The power had gone out the night before, the cell phone signal early that morning. Only the radio with the one AM station that had managed to stay on air. That night we listened to reports of people being rescued from the roofs of their flooded homes. Thirteen days earlier I had woken up at dawn and checked the news on my phone and the first thing I saw was that Irma had left the entire island of Barbuda without communication. It was terrifying. I thought of that scene in Star Wars where Darth Vader blasts Leia’s planet while she watches from space. While Irma only skirted Puerto Rico, María was a different story—but the same kind of terror. Puerto Ricans know about this kind of thing. For over sixty years, the U.S. navy used the island of Vieques as a bombing range, exposing residents to napalm and other toxic chemicals. 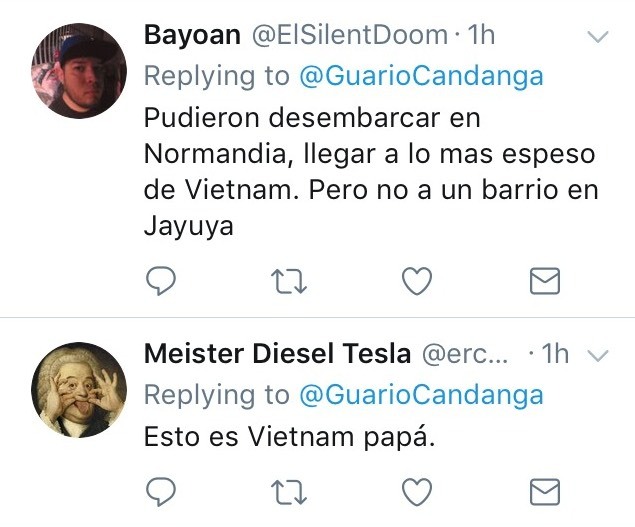 While Vieques is perhaps the most well-known case because of the visibility gained by popular protests, other islands in the Puerto Rican archipelago, such as Culebra and Isla Desecheo, have also been bombed in military practices. These histories have a strange afterlife. They mutate into new kinds of monsters. 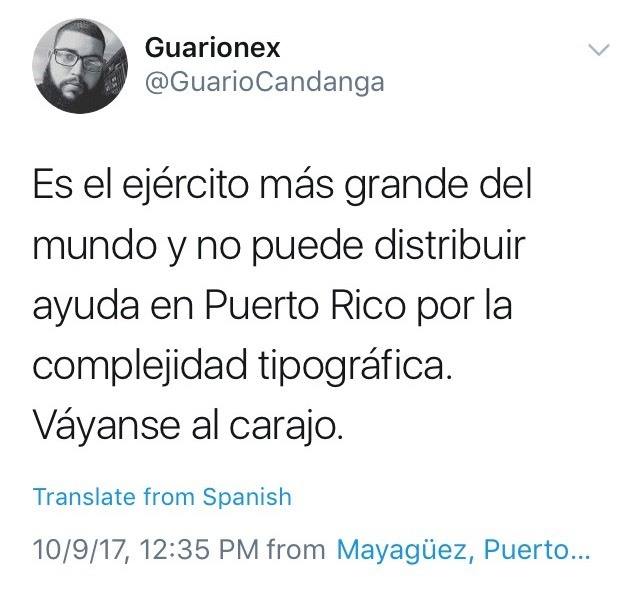 In September 2017, United States imperialism and climate change came together in debt-crisis Puerto Rico to create a hurricane bomb. 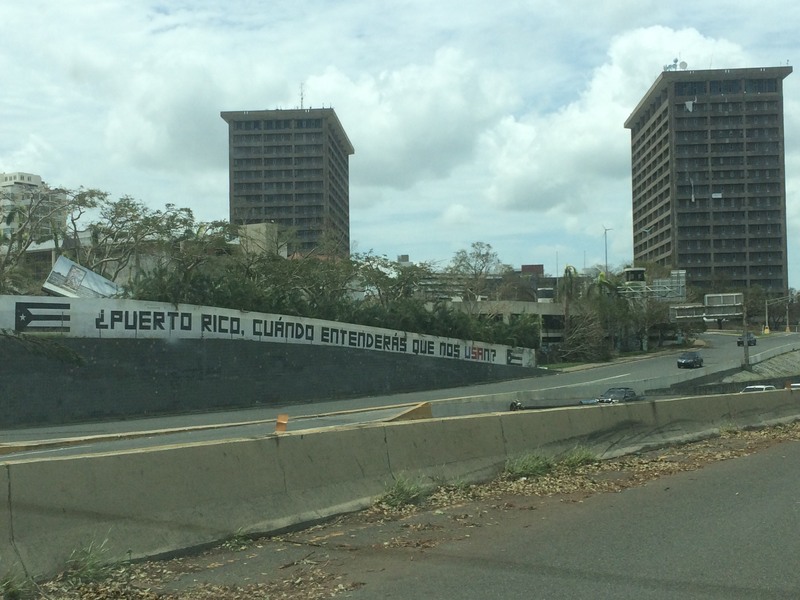 “Puerto Rico, when will you understand that they use [USA] us?” Photo by the author. Have we just been invaded? … Again? Driving past my neighborhood gas station I saw a woman in camouflage uniform. They had arrived. I knew they were coming because the general had spoken on the radio, with a twangy American accent. But it was different to know. Farther down the road, a huge olive-green hummer. Elsewhere, two military trucks with people crowded in the back. More helicopters flew overhead. Sometimes the people on the ground waved. Sometimes the people in the helicopters waved back. In María’s aftermath, the colonial state took control of the rate at which relief arrives and how it is distributed or not distributed. Through FEMA and the military, it also assumed control of the three most important resources: electricity, fuel, and water. The U.S. Army Corps of Engineers installed FEMA generators at public hospitals, water pumps, and water treatment facilities, and delivered diesel to keep these and other generators going. They also undertook repairs to the power grid in partnership with the Puerto Rico Electric Power Authority and with its contractors. In this reenactment of invasion, the federal government’s relief efforts underscore the idea that Puerto Ricans are unfit to govern themselves—a racist notion used a hundred years ago to define Puerto Rico’s status as an unincorporated territory, a status that has entrenched the island’s economic dependency on the United States. Emergency, looped through Puerto Rico’s debt crisis and ongoing colonial history, becomes as normal as the army engineer standing in front of me at the Walmart checkout line buying shampoo, shaving cream, and peanut butter. The militarization and securitization of Puerto Rico respond to certain kinds of threats, to certain terrors. Soon after María the governor declared a curfew that lasted for almost a month. At night, from my view of San Juan, the bare trees revealed the flashing blue lights of police cars silently moving up and down the streets. During the day police were present at the few gas stations open, the ones with the lines for kilometers and no guarantee that there will be gas or diesel when it’s finally your turn. The trucks delivering fuel were escorted by police, federal agents and the National Guard. The request, according to one report, came from wholesalers, distributors and gas station owners who felt threatened by citizens desperate for fuel. The scene took be back to last summer, when I watched on television how trucks escorted by police carried industrial waste to Peñuelas, a municipality in southern Puerto Rico where residents attribute health problems terrible health and environmental problems to the ashes dumped by a company that burns carbon in a power plant. At the entrance to the dump site police dragged away protestors lying on the road and then lined the street so that the trucks could pass through, in a live-on-the-morning-news declaration that the state will protect corporate interests from desperate citizens. What happened—and is happening—in Peñuelas offers clues about the kind of social order that security efforts in contemporary Puerto Rico work to uphold. Fears generated by the hurricane’s destruction also mobilized private security. Ranger America, one of the companies very busy guarding businesses and government installations after María, announced incessantly on the radio that was hiring. No experience necessary. All you need is a gun license. Pay starts at $18 an hour. 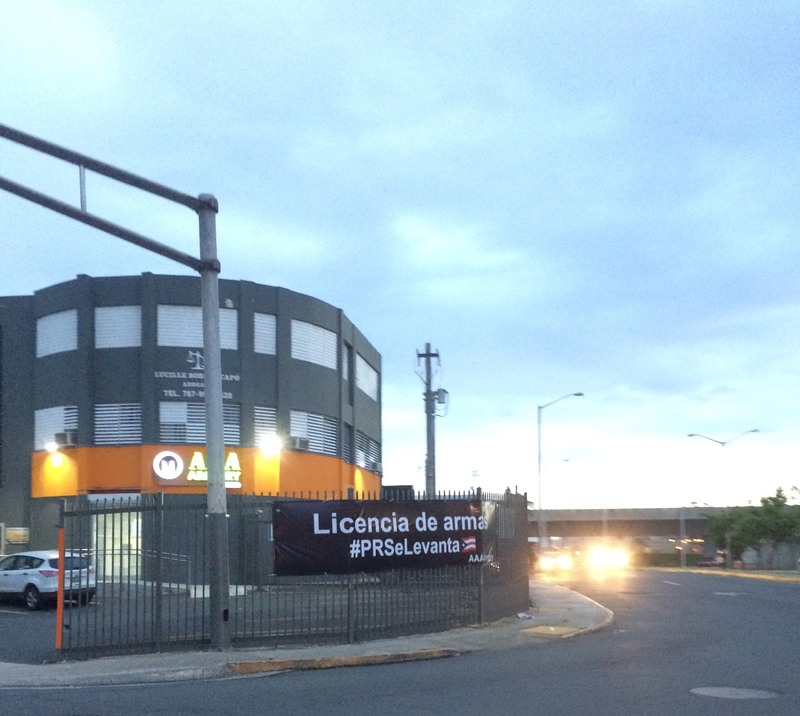 A more select kind of security personnel could be found outside the Ciudadela in Santurce, a housing and business complex that belongs to a hedge fund billionaire benefitting from Puerto Rico’s tax breaks for the rich. According to the Center for Investigative Journalism the guards armed with machine guns, rifles and knives work for Academi, the military company that was called Blackwater when it massacred civilians in Iraq. “Gun license. #PRSeLevanta.” Photo by the author. If the terrors of United States warfare entangled with petrocapitalism are visible in the streets of Puerto Rico, they also reach the intimate space of the home. How do families prepare for the terror of the end of this kind of world? If you’re like Joseph Badame of New Jersey, you build an underground bunker and spend forty years hoarding food and supplies. It’s a story with weird twists, reported in the local New Jersey press: Joseph and his wife Phyliss began preparing to survive economic collapse after witnessing riots in Camden, New Jersey, including after the death of a Puerto Rican man at the hands of white police in 1971. They added a lead-lined bomb shelter “just in case.” Phyliss had a stroke and the costs of care added up. By the time she died, they had no money left. When the bank moved to foreclose on his house, Joseph arranged for an estate sale and at that estate sale he met Victoria Martínez-Barber, who ran the food truck hired for the event, and whose family in Arecibo, Puerto Rico had lost their home to María. He gave her all the food and supplies from his shelter to send to survivors. Victoria now lets him park his RV, where he now lives full-time, in her yard. I like to think that by then Joseph knew that the economic-racist meltdown he feared was in fact a terrible reality, not just in the shape and place he had expected. That the violences of the Anthropocene are geographically distributed in uneven but interconnected ways. In Puerto Rico people bunkered for María like they have done for other hurricanes. But the bunkers don’t tend to be of the doomsday survivalist sort. The bunkering I am most familiar with involve installing metal or plywood shutters, tying down roofs and other things that could blow away, rushing to the supermarket before the bottled water and canned Vienna sausages are all gone, and filling the tank of gas—if you can afford these things. Despite such preparations, bunkering offered little protection for many people from María, much less for the aftermath: standing in lines for hours, eating soda crackers for days, drinking water that is probably contaminated, enduring the unbearably slow restoration of power. Amidst this catastrophe the Puerto Rican government, federal agencies, and their contractors work to assure people that progress is being made. They fill the newspapers and other media with constant updates, graphics, statistics, percentages, technical talk. In this way, people receive a lesson about physical endurance at the same time that they are told be patient, stay calm, normal life is being restored. These lessons encourage people to build bunkers of the mind and body, to become living breathing fortresses prepared physically and psychologically for future hurricane seasons in an economy that gets worse by the year, to believe that #PRSeLevanta—that Puerto Rico picks itself up. In English the slogan echoes the metaphor invoked by Operation Bootstrap, the postwar program to industrialize the island by promoting U.S. investment. But, like the doors and roofs blown away by María, these fortifications of the mind and body are flimsy. Across the island that is many islands, people pick up what is left of their homes and lives. What can’t be rebuilt, however, is the certainty that everything is going to be ok. The next hurricane season, after all, is just a few months away. Rosa E. Ficek is a Research Associate at the Institute of Interdisciplinary Research at the University of Puerto Rico at Cayey. where she researches the changing relationship between nature and nation in the current context of debt crisis and climate change. She is also working on a book about the Pan American Highway that examines how roads make and unmake borders. Her work has been funded by the Woodrow Wilson National Fellowship Foundation, the Ford Foundation, the Wenner-Gren Foundation, the Social Science Research Council, and the Mellon Mays Program. Rosa holds a B.A. in Anthropology and Spanish from Cornell University and a Ph.D. in Anthropology from the University of California-Santa Cruz.